from the album "The Green Field""
Believe it or not, I have actually had the fundamental 'germ' for this piece, which appears at [I] since 1984, after "Casa Loco" was recorded. I have NO idea as to just WHY I was never able to finish composing this tune until 2005. However, when I returned to New York from a European Tour in March of that year, I knew that I would be dedicating every waking moment to the completion of my original tunes, and to the arranging of the others. And so, I was confident that this piece would finally come into its finished form. I chose to frame everything within the contest of a minor blues, and, I even put to use some "solo changes" which are reminiscent of harmonic devices Wes Montgomery had employed in the past. Obviously, it is dedicated, and with all due reverence, to the great Elvin Jones! And so, "El Viñón" was born. It was designed to feature all the significant players, and, at the end, to give Jack Dejohnette a chance to express himself in this regard. As it is with everything I wrote and/or chose to play, the most important thing to me is that it must have mood and attitude!!! Those two elements arrive immediately with the basic vamp at [I]. If you follow the lead sheet, you'll see that this 'groove' is truly the cornerstone of all that surrounds it. I suppose that it's a little ironic that this tune ended-up in the key of Eb minor, which is the same key as "Uncle Roy" was played. It is no less ironic that, when we began to develop that tune, my 'instructions' to Steve Jordan were: "It's supposed to be kind of an Elvin thing!" Of course, Steve ignored me, and came-up with something very much his own. In this same regard, the only thing I said to Jack was that the tune is dedicated to Elvin, nothing more. I remember, after we had recorded the tune, going into the control room and clearly hearing Manolo Badrena's tubular whistle and thinking to myself that we had just recorded a spacier, darker type of 'theme' for one of Clint Eastwood's early "Spaghetti Westerns." Again, a little detail like that contributes mightily to the mood. You can also see that John Patitucci was free to ignore the little bass sketch I wrote to give him a place to start. Mostly, I just told him to keep a bluesy attitude while playing what felt right to him. Though we do end-up soloing over a 12-bar minor blues form, the melody statement does not resemble that at all. I simply went by what 'felt right' to me. We do have the im7 chord, followed by the ivm7 chord, and a return to the im7 chord, but letter [C] gives the turnaround a very different look to the form. It is during this section that the only overdubs are introduced. Here I used my ESP Strat, in conjunction with a volume pedal, a much brighter sound, and the tremolo bar, to create a spacey wash of harmonic color. Along with the voicing that was played live, I added,spelling up, B-C-E against the F#m7b5; and G-A-B against the A7(9) sonority. In each case, a more interesting cluster of notes was created. When writing and arranging a new composition, I try to never succumb to getting "a case of the clevers." In other words, trying too hard to make the music constantly new and interesting. What I want to accomplish is to keep everything within a very basic flow, but, of course, maintain a level of surprise and interest too. So, the various 'break figures' we all had to negotiate bear a resemblance to one another, but some vary from the basic figures, which appear at the end of most of the [I] sections. The first little detour occurs during the 2nd ending of the [I] just before [B]. In bar 4 of [C], the figure on beats 3 and 4 mirrors what is to come in the break which precedes the guitar solo break, and the arrival of [D]. The last point of interest is the final break figure, which appears 2 bars before [F], and serves as a 'rocket' into Jack Dejohnette's solo, his personal salute to Elvin. Another very small detail, which we arrived at during the rehearsal, and refined prior to recording, appears in two similar spots during the melody statement. With the strong accent on beat 4 of bar 4 of [A], located on the 4th system of Pg. 1, I felt that it would be best if John and I left beat 1 empty on the 1st bar of [I] in system 5. So, keep this in mind if you are following along with the music. This same device appears again on Pg. 2, just after the last bar of [B2]. Since these pages were first launched, I have updated the lead sheets to more accurately reflect what we actually played. All this reminds me of something someone once shared with me that Stravinsky had said, when he asked, rhetorically: "What is the most important part of the pencil?" To which he answered, "The eraser!!!" 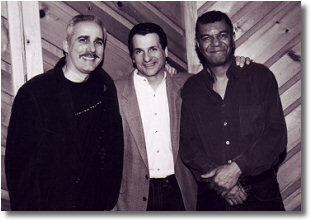 What remains as so impressive, that which has not changed nor wavered since we recorded "Got My Mental" together in '96, is the relentless fire, creativity, and energy that both John Patitucci and Jack Dejohnette bring to each performance. When one has to function as the artist, and the producer, it is such a relief to know that these are qualities you can just take for granted with players like this, because it is a given that they are going to put out, and give everything. They both also know that I am not one to abuse this privilege by doing more takes than is necessary. Like our prior recording together, most of what you hear was done in one take, and that was it. "El Viñón" somehow required 3 takes, and, in some regards, it was difficult to choose between the latter two because of Jack's tremendous playing. However, one must always "serve the song" and so, Take 3 was executed far better from that point of view. Recently, while preparing for some potential live work, I decided to face the inevitable and compose an actual ending for this tune. So now, when you look at Pg. 4, you will see a [Tag], which represents the new ending. As I would normally do, the ending incorporates and extends a fragment from [A] which gives the group a solid, forceful and definitive ending. This to me is usually better than a long, drawn-out chord. So, for those of you who want to play this tune with your own group, or even just a rehearsal group, you now have an ending to use. Have fun with it!! The fine art of sequencing a recording is never easy and there is no exact science for this. Generally speaking, one wants to begin with a piece that well represents the general focus and thrust of the entire recording. Usually one would choose something with a brighter tempo, and an engaging melody. 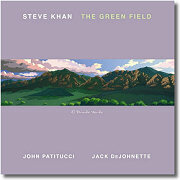 When "The Green Field" had been completed, and all the tracks were chosen to fit within the constraints of not wanting to exceed 78-minutes, my process of selection began. In the end, I felt that "El Viñón" was the best way to go, even though it defies the qualities that I have just stated. However, it is rich with other elements, and certainly mood and attitude are principal amongst them. But, in addition to that, it seems to set a most serious tone for what is to come, and that, for me, became the key consideration. I guess I also have to add, where the title is concerned, that this pronunciation of Elvin's name is really one of my most treasured and early memories of working in New York. At times, during those early years, I had the great privilege of working with "Chino" Pozo, and I recall one night being invited by him to go see "Elvin Jones at the Village Vanguard." But, all I can tell you is that, to my then uneducated ears, that sentence, coming via a thick Spanish accent, did not sound that way to me. So, the way this song title is pronounced is, in great part, a recollection of those great times with "Chino." He was truly one of the great, great characters on the scene here. He never actually ever rented an apartment, he always lived in midtown Manhattan, in a small hotel room, with a kitchen. I guess that he too believed in the temporal nature of things. He was a really great cook. Gracias hermano!! !